Belt Fed Nerf Vulcan EBF-25 Now Available, Gladiator Not Included | OhGizmo! We posted about the Nerf Vulcan EBF-25 back in February, and some of you seemed to want one. Or something. Anyway, I think it’s wicked cool, and it’s now available from Hasbro for the promised price of $40. That’s right, you get a fully automatic Nerf dart Gatling gun for just 40 clams. Turns out you get a little extra, too… The “Value Pack” includes a shoulder strap plus one extra belt and darts, for a total of 50 rounds. 50 rounds is good for about 16 seconds of firing, as the EBF-25 tops out at a meager 3 RPS. Max range is rumored to be pretty poor, and with 6 D batteries to power it, it probably weighs a ton. But I’m not worried. It’s only been out for like a day, and somebody over on NerfHaven has already hacksawed one in half to improve airflow and increase range. I’m looking forward to some DIY modding that turns it into a Nerf version of this. 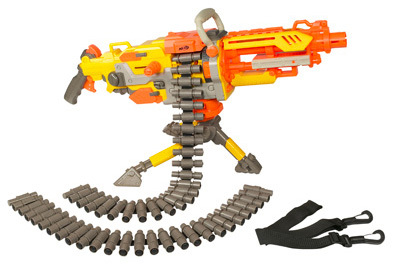 The Nerf Vulcan EBF-25 looks to be available online, and in Wal-Marts in Colorado but nowhere else (?) yet. It’s NOT a Gatling gun! But I still want one.